Thinking Out Loud In Sturbridge: Really? All This Over An Opinion? Really? All This Over An Opinion? Code of Conducts are important. I live by my own personal code, and follow a similar one at work. Politicians have a code of conduct as well. You can imagine the items that are mentioned in a politicians code of conduct, and having an opinion is not one of them. Opinions define just who a politician is. Whether they are sitting "behind the table", or walking along Main Street, they represent us, and are bound to have one. They are also bound to share it on our behalf. Conveying ones opinion about an action, or political issue does not show disrespect, quite the contrary. It has prompted a response, an opinion, a counter to the issue, and in politics, that shows respect. It shows that the issue is worthy of an opinion. Pro and con. For and against. 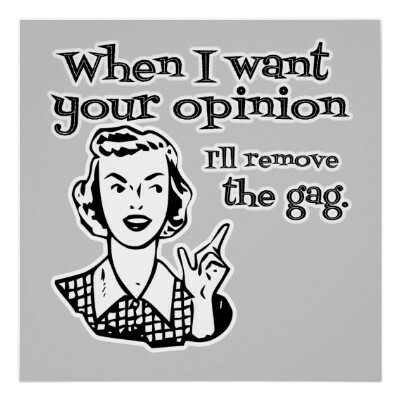 Opinions matter, and must be shared appropriately. Local politicians voicing disappointment, or opinion cannot be restricted by a code, although the manner in which the disappointment is conveyed could be. A plane pulling a banner proclaiming, "I'm Pissed at You" would not be appropriate. Simply stating a political decision is "illogical" and "wrong" is. It is opinion. It happens every hour of every day in Congress. It is politics, just as threatening retribution is well known to those in politics, and was done in this case as well. Opinion vs. retribution for voicing opinion. It truly doesn't matter what prompted the issue. It was political, and our politicians are not immune from behaving like politicians. What is important is when one that we have elected, or has been appointed to a position, is told that their spoken, appropriate opinion is against a code of conduct, then it is time to re-read that code, and if it is true, then change it. Code of Conduct cannot be used as a guise for limiting appropriate behavior, or impinging on free speech. We all know of times when that has happened in the past, and didn't go well for those that started it. Limiting how one voices how they feel about decision made by the Board of Selectmen by invoking a "Code of Conduct" is something that our forefathers never intended to have happen. Do those that are that are unnerved by opinions other than their own capable of being the representative for others that have their own opinions? Are those with thin skin, and heavy hands, the ideal leader, or someone that can role with opinions other than their own, and not let it bother them, other than to, at the very least, respect them? Just asking. Talk amongst yourselves. STURBRIDGE — Several Planning Board members violated the town’s code of conduct when they took the selectmen to task for not approving one of its nominees to one of its subcommittees, according to the chairman of the Board of Selectmen. Thomas R. Creamer, chairman, said it was “absolutely well outside of the authority” of several Planning Board members when they made disparaging comments about the selectmen earlier this month. Furthermore, Mr. Creamer said, it was “very small” for Planning Board Chairman Sandra Gibson-Quigley not to give Selectman Priscilla C. Gimas, vice chairman of the Board of Selectmen, an opportunity to respond. Mr. Creamer said he would reflect upon actions of individual Planning Board members when the time is appropriate on whether he would support reappointments. On Feb. 12, Ms. Gibson-Quigley called selectmen “illogical” and “wrong,” and said they are “doing a disservice” for not appointing a person the Planning Board unanimously supported as a member of a subcommittee. Charles T. Blanchard, who the Planning Board unanimously voted (7-0) as one of its two allotted members for the Commercial Tourist District Working Group, was shot down by the selectmen twice in two separate 3-2 votes. Previously, Mr. Blanchard said he was concerned with Mr. Blanchard’s spouse (Mary Blanchard) serving as a member and also his level of involvement on other committees. In a 4-3 vote, the Planning Board voted for Penny J. Dumas as their new nominee for the Commercial Tourist District Working Group. Monday night, selectmen voted Ms. Dumas in with a 2-0-1 vote (with Mr. Creamer and Ms. Gimas voting in favor and Selectman Mary Dowling abstaining). Creamer makes "disparaging remarks" often from his selectmen seat. He often does not allow fellow selectmen have their say. I think he went on the rant to draw attention away from Gimas and her disparaging remarks about upcoming appointments to the Planning Board. I bet that the BOS would appoint people to boards that were already on other committees, or were related to other board members if it suited their needs. Watch, it will happen someday, and then there will be some vindication. I agree with the the other anonymous person, it is stupid. According to Creamer what part of the code of conduct did the Planning Board members violate ? Thomas Creamer is a bully. Always has been and always will be. If the Planning Board violated the 'Code of Conduct' (whatever that means), Creamer runs roughshod over it every day. He should just collect his 'disability' checks and sit at his computer and resign from office. It really is too bad, when Tom first was elected to the BOS he did a fine job, but now it seems that he got full of himself, forgetting that he is only one vote on the BOS, he is not Town Administrator, and he is not the redeemer of Sturbridge, in my opinion just about the opposite. He should stop trying to be a one-man band. Think back to all those hateful things he wrote on his blog about people a few years ago, but despite it all he was elected. Now people are shaking off the fairy dust to see just what kind of person he is. If you disagree with Tom Creamer he will come after you with all he's got. This is another example of his horrible antics. He violates the code of conduct weekly, he attacks someone at almost every meeting. STURBRIDGE — Town Administrator Shaun A. Suhoski hinted Monday night that residents will most likely get hit with a large rate increase for water and sewer use in fiscal 2014. Presenting preliminary information from Town Finance Director Barbara A. Barry, Mr. Suhoski said residents can expect a water rate of $5.90 per 100 cubic feet for next fiscal year — that would be 92 cents, or 15.5 percent, more than the current fiscal year — and a sewer rate of $11.16 per cubic feet, which is $3.19 or 40 percent more than this year. The new fiscal year begins July 1. The current water fund and sewer fund balances are $1,198,797 and $1,481,385, respectively, Mr. Suhoski said. If the town uses $20,000 from the water fund balance to offset the water rate, it will be $5.80 per 100 cubic feet for fiscal 2014. If the town uses $50,000 from the sewer fund balance to offset the sewer rate, it will be $10.90 per 100 cubic feet for fiscal 2014, Mr. Suhoski said. In April, selectmen unanimously voted to raise the water rate to $4.98 per cubic feet for fiscal 2013, which was 57 cents, or 12.9 percent, more than the previous fiscal year, while keeping the sewer rate at $7.97 per 100 cubic feet. In fiscal 2012, the water rate went from $3.27 to $4.41, which was an increase of $1.14, or 34.8 percent, while the sewer rate went from $4.59 to $7.97, an increase of $3.38, or 73.6 percent. In fiscal 2012, the rationale for the increase was because water and sewer operations have increased significantly because of debt service associated with the Route 131 water main project, $1,557,000; well No. 4 construction, $3,769,000; and wastewater treatment plant upgrades, $17,666,000. A public hearing for fiscal 2014 will be held at a later date. How come your old job in Ayer the water rates are a bargain compared to Sturbridge. Why can't you do what you did in your past job. Here is the rates in your former town. Since when did Mother Nature started charging for Water. If so lets see the Invoice. Its going to cost a fortune to flush the toilet in Sturbridge..
Shaun Shoski, together with the Finance Committee Mafia, are huge threats to the contined financial stability of Sturbridge if you're not wealthy. This years budget will be bad, really bad, if what Ive heard at meetings is true. Look for a $20+ single tax rate next year...maybe even $21, because FinCom--an un-elected board who are appointed by a three way cabal between a delusional town moderator and Chair Kevin Smith and longtime FinComm Don Larry Morrison (with them you're either "made" you dont get appointed to the club.) is plowing straight ahead with the same "spend it all" mentality they've always had and Shaun, who was hired by the Selectmen, seems more interested in appeasing unions and town hall workers and the public safety cabal than try to maintain some budget control. Under Shaun's tender mercies this year, taxpayers can look forward to more than a million in needless expendetures he feels no need to push back on...from his recommendation to add more positions to town goverment (Full time Building Inspector, Town Facilities Manafger) to large raises for all town department heads (Finance Director 16%, Town Planner 12% and 3% for all department heads matching their yearly bonuses). He wont push back to the Police Chief (Lives in Brimfield) who wants 3 new crusiers (140K) even though Chief has 10 cars now. He wants to float a huge bond to rebuild Champeaux Road and a perfectly fine (but narrow) bridge there. I could go on, but suffice to say because Shaun has no "skin in the game here' and takes his $109k salary home to Ashburnham (bet their tax rate's lower) he's disconnected from the pain his recommendations and blunders cost seniors who now chose between food and sewer and tax bills and lower middle class families struggling to stay afloat in Sturbridge. Nice work if you can get it for Mr Suhoski. To heck with the rest of us. Today's nearly $18 dollar tax rate will be tomorrow's nearly $20 if people allow Shaun and the Finance Committee Mafia (who are un-elected & answerable to no-one) have their way. In '14-15 it will go toward $21. Add about 80 cents a year and you can decide your squeak point. Get involved, call or talk to the Selectmen and Mr Suhoski, and tell them to cut raises, kill purchasing, and level fund the budget. Go to Finance Committte Meetings and tell them the same. Most importantly, go to town meeting on May 2nd vote to kill this years budget and send it back to committee. The world wont end if you do. Or, enjoy your new high real estate tax bill and your higher sewer/water bill. Its that simple folks. A follow-up to my last comment (thanks for posting it). Got a copy of Sturbridge Villager in our box today. Theres a story in it about the town's "AA" rating in a recent audit. If you need more proof how much trouble Mr. Suhoski is, go the the section in the story where he is quoted as saying he wanted to give 5.5% raises to department heads because "we have the revenue". Hey bub, that "revenue" is the vacation I wont be taking and the cash for the badly needed replacement for my rusty 11 year old truck I WONT be getting because my real estate taxes just went up. Its also the meal seniors who cant afford to eat (who now go to the Senior Center to get it or starve). Mr Suhoski has big tin ears to go with his big blind spot for reality. We're not people, we're "revenue" to this guy! Your correct as these guys are living in bubble. A Moodys Bond Rating of AA is only the credit worthiness of the Debt for the Investors. This is not a pat on the back on the Financial Spending and Management of the Town. Look at Washington the bonds have a top ratings in the world but we are in debt to our eyeballs and will take generations to pay for if it ever happens. Here is the website from Moodys on the Ratings. Notice its not saying about the Budget and Management, its only discussing Bond Rating for the Investors. These guys on the board being the experts never explain that. Also let them keep it up and even the homes they are living in Sturbridge will only go down in values as we are going to approach being the highese tax rates in the states with the least amount of amenities. We have no train service, bus, or any commuter service unlike other towns so our expenses should be less and more manageable. Second what do we need a Full Time Building Inspector, we are building nothing. Go ride Route 20 and look, more empty buildings and been like that for the past decade. Even American Motor Lodge was home to the State Police to bring the dogs for training. He is even smart and tore it down. So he will only pay now for the land taxes as there is no Building now, very smart move on his part. So what about that shortfall on taxes. Instead we should be tightening the belt as others will not be far behind what he done to his building to the other buildings that are in disrepair in this Town. Start looking around and there is a lot of them. That position (Building Inspector) can be contracted out at a big savings to the tax payers. No need for a full time position, as you recalled in the past the old one complained about being used as the Town Sign Policeman. With no future growth here why spend more, who is going to pay for it in the future, they following the typical let the children pay for it. These guys are fast to raise the taxes but wont spend any time analyzing how to budget and make the town efficient. I would bet they don't practice that in their own private lifes. Treat the taxpayers money like it was your own. The American Motor Lodge is not owned by the town of Sturbridge. It was torn down by the present owner to make way for a new hotel. The sewer rate is sky rocketing because of the new sewer treatment plant that was voted on at town meeting the select board at that time wanted a smaller plant less expensive and would have been a smaller sewer rate increase. You can thank Tom Creamer for the sky high sewer rate increases. Go back look it up. I'll tell you why it was torn down.... The owner had plans to build a hotel, and a restaurant. The town was giving him a hard time about his plans. The owner retaliated by tearing the building down and paying lower twxes on the undeveloped land. Let's wait amd see how long that groumd sits.